You can create a quote from your cart. Use the transceiver in your device. That's it! The most popular wavelengths for singlefiber transmissions (bidirectional) are 1490nm/1550nm/1310nm. Combinations like 1490nm/1310nm or 1550nm/1310nm are frequently used for short distances below 40km.Sometimes it is difficult to select the proper singlefiber wavelength pair. Just imagine you have a project where either 1490nm or 1550nm as transmit-wavelenths are used. Do I really need to stock both counterparts and do all the logistic for these transceivers? "Just wanted to express my giddy happiness at how fast your crack team of ninjas were able to get optics to my desk." "Very easy to use and quick too. 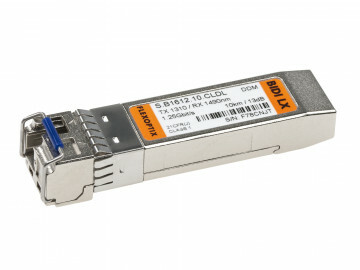 I particularly like the ability to use the same configuration on a number of transceivers just by ticking a box - a real time saver"
"The FLEXBOX allows us to use 100MBit/s to multi-gigabit transceivers in our product for a wide range of customer needs. We can not solve them without this magic box!" "It's just a genius device. So easy to use and simple! I would recommend it to every network engineer. Plug-in the module, program and its ready for deployment!" I hereby declare my personal consent to receiving answers to my request by unencrypted e-mail. I can revoke this consent anytime for the future.